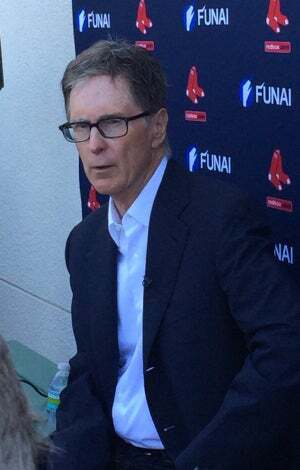 Henry, who purchased the Red Sox before the 2002 season, said it’s an “ever-changing challenge and incredibly difficult” to compete against the other teams in baseball. Henry said in 2012 that he was against the idea of giving long-term contracts to free agents. That came in the wake of the Red Sox trading away the disastrous contract given to Carl Crawford. The Red Sox remain a high-revenue franchise, but Henry has not abandoned that ideal. Henry does not necessarily regard the $189 million luxury tax threshold as a ceiling for the Red Sox, however. Under the terms of baseball’s latest collective bargaining agreement, teams under the threshold were eligible for significant rebates in revenue-sharing payments. But Henry said he questioned at the time how beneficial that was and that his projections were accurate. “There were certain incentives built into the season that at the time I doubted they would really carry the day and that appears to be the case. They probably won’t,” he said. With the restrictions on spending in the amateur draft and for international free agents, big-spending teams teams like the Red Sox have lost some of the advantages they once enjoyed. Henry offered no thoughts on who he thinks will replace commissioner Bud Selig once he retires. Henry said the team was willing to discuss a contract extension with David Ortiz. He also was “glad to hear” that Jon Lester wanted to stay with the Sox, but said general manager Ben Cherington should be asked about contract issues.